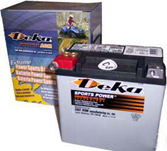 This guide will cover Motorcycle, ATV, and Personal Watercraft Batteries. For many who have these types of vehicles, they are rarely used, or not used as often as one would like. When a battery sits without being used, it is self-discharging, at approximately 1% per day. As a battery discharges, sulfation can begin to form. Sulfation is a build-up that takes place internally, on the plates of the battery. When a battery is charged, either on a trickle charger, or by a built in charging system, sulfation is knocked off the plate walls. Over time, more and more sulfation will stick to the walls, which takes away from the capacity of the battery, and can cause premature failure. 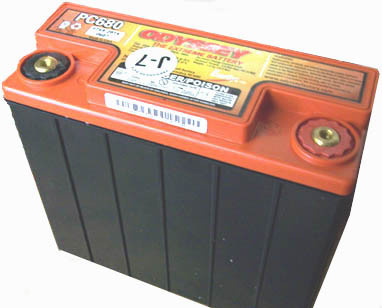 If the battery being used is a maintenance style battery(with removable caps) the water level must be checked periodically. If the water level falls below the plates, sulfation buildup on the cell walls will increase exponentially. If the battery is AGM(Absorbed Glass Matt), Gel, or SLA(Sealed Lead Acid) there is no need to check water level. The best defense against sulfation is to keep the battery from self-discharging. Now if the vehicle is being used every single day, it is being charged by the built in charger on the vehicle. However, if the vehicle sits for 2 days or more at a time, it is best to use a Battery Maintainer for optimal life. Our battery maintainer, pictured above, is a fully automatic, 1.5 amp charger with a quick disconnect. A cable with a small lead is connected to the battery permanently, when your ready to ride, simply pull the cable apart and take off. There is no need to hook and unhook the cable from the battery. Since the maintainer is fully automatic, it senses when the battery is fully charged, and stops charging. When the voltage reaches a certain level, the maintainer automatically starts charging again. These batteries can easily be overcharged using an incorrect charger. The absolute highest Amperage that should be used is 2. Anything higher will charge the battery too fast, heating it up too much, and gradually damaging the plates inside. Heat and Vibration are also two of the leading causes of pre-mature battery failure. The best solution to this problem is to use either a Deka or Odyssey battery. Odyssey and Deka batteries are American made and built to high quality standards. They have thicker casings which handle heat and vibration much better than the foreign made batteries. Please call us at 386-328-9024 or email us at service@BohannonBattery.com for any battery or charger related questions. If this guide has been helpful, please email your friends and family our website, Http://www.BohannonBattery.com. The first step to prolonging Golf Cart batteries is to check the water level of each battery before every charge. Before even connecting the charger to the Golf Cart, remove each cap or caps, and ensure the water level is 1/4 inch above the vertical plates in each cell. If a cell is low, refill using distilled water. (Wear safety goggles and protective gloves, acid from the batteries can be hazardous to your health, causing blindness and skin burns!) Distilled water should be used instead of tap water. Tap water contains minerals, which will settle to the bottom of the cells and increase the chances of an internal short. It is important to note that filling the cells with too much distilled water will pose a potential problem. When a battery is charged, it heats up internally, which causes expansion. As this occurs acid can overflow from the battery, getting all over the metal frame of the Golf Cart. Of course acid on metal causes CORROSION, and will eat away at the frame. A preventive measure that should be done every two to three charge cycles is to check the tightness of the nuts on the studs of the batteries. Typically the nut size will be either 1/2 inch or 9/16 inch. If the nuts become lose, the battery terminal can heat to such a degree that it will melt. Check the battery cables at the same time and make sure they are not corroded. The last step and equally important as step one, is to charge the batteries properly. Batteries have a certain amount of charge cycles. If the Golf Cart is driven fifty feet to the end of the driveway, and then back to its storage location, DO NOT place it back on charge. Wait until the Cart slows to an unacceptable speed before placing back on charge. In some circumstances a person may go a whole month before ever needing to place their Golf Cart on charge. It may be a good idea to invest in a good heavy duty battery Hydrometer. A battery hydrometer is used to check the specific gravity of battery cells. By knowing the specific gravity of a battery, you also know the charge level of the battery. A hydrometer can also be used to determine if a bad cell is present in the battery. When using a hydrometer to check the cells of a battery, each cell should have the same reading. If a cell is found to be significantly different from the others, it is a potentially bad cell. I say potentially because if distilled water has recently been added to the cell, it will read lower due to a diluted solution of acid. So if this is the case, discharge the battery and then recharge completely. After this cycle has been completed, if the cell still reads lower than the others, that battery has a bad cell and the battery is bad. In the event that the Battery Charger stops working, we also handle 36V and 48V Golf Cart Charger repair. Call us at 386-328-9024, or email Joshua@BohannonBattery.com. We also stock Lester Electric Golf Cart chargers which can be found by clicking here. A Cell Phone Batteries useable life, on average, is two years. I define useable life as lasting for at least a whole day, without needing charge. When a Cell Phone Battery has to be charged mid-day, it becomes an inconvenience, and its useable life has ended. Steps can be taken to pro-long the useable life of the Cell Phone Battery. The first step to prolonging the cell phone battery is to keep it out of extreme temperatures. It can become extremely hot inside a parked car. If the cell phone must be kept in the parked car, keep it out of direct sunlight. Heat is one of the top killers of cell phone batteries, as well as batteries in general. The second step to prolonging the cell phone battery is charging method. I always recommend that an AC House charger is used rather than a DC car charger. In older cellular telephones, NimH(Nickel-Metal Hydride and NiCd(Nickel-Cadmium) batteries were used. These types of chemistries had a memory effect. In other words, if the battery were only drained by 25% repeatedly, it would develop a memory. At that point the battery would lose a great deal of its capacity. With the newer Lithium batteries, technically there is no memory effect. There is what is referred to as "Virtual Memory" effect. The virtual memory effect happens when a cell phone shows full charge on the battery, and then quickly drops down to one bar, or almost discharged. In some cases this is actually a bad battery, but in many cases it can be the virtual memory effect. When it is in fact the virtual memory effect, the battery will still last the same amount of time, but the battery meter on the cell phone will be inaccurate. To re-sync the battery meter on the cell phone with the actual charge level of the battery, the battery needs to be discharged until the low battery alarm comes on. This should be done on a monthly basis. The cellular telephone should also be powered down on a periodic basis. Today cell phones are just like computers, they need to be restarted once in a while. The longer it stays on, the more bogged down, and slower it can get. This is especially true for Smart Phones such as the Iphone and Blackberry. Often times a cellular phone battery that is bad will have bulging sides. It can be difficult to see the bulging sides, but there is a simple test. Place the battery itself on a flat surface, and spin it. If there are no bulges, the battery will stop spinning almost immediately. If it is bulged, it will spin like a top. If it spins like a top, it should be replaced. Another indicator of a bad battery is a hot battery. During charging and use the battery may become somewhat warm, but it should not become hot. If it is hot to the touch, it should be replaced immediately. If your battery is not performing like it should, we have the cell phone battery for you, as well as chargers, click here to visit our Cell Phone Battery and Charger Cross Reference page. This guide will cover connecting Lead Acid, AGM, and Gel batteries in Parallel and Series. There are many reasons more than one battery may need to be connected to a system. A higher voltage may be necessary, or more power may be required than what one battery can provide. Ideally when multiple batteries are connected together, batteries of the same chemistry, age, brand, and capacity should be used. So for the rest of this guide it will be assumed that this is the case. When two or more batteries are connected together, either by parallel or series, that system will be referred to as a battery bank. Batteries are placed in Parallel when either a higher capacity, or more cranking power is required. In order to place two batteries in Parallel, the positive of the first battery is connected to the positive of the second battery by some conducting cable. The negative of the first battery must also be connected to the negative of the second battery. If two 6 Volt, 200 Amp Hour, 400 Cranking Amp batteries are connected in Parallel, then the output would be 6 Volt, 400 Amp Hour, and 800 Cranking Amps. The Voltage remains the same while the Cranking Amps and Amp Hour(capacity) are doubled. 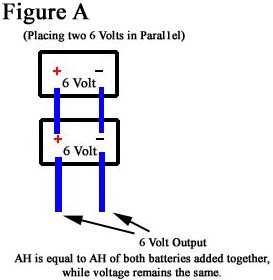 Figure A below shows two 6 Volt batteries connected in Parallel. The House side batteries of a Motorhome. Batteries being used to power a Trolling Motor. Batteries used to start a High Power Boat Engine. Batteries used to start a Diesel Engine. Batteries can be Paralleled indefinately to achieve whatever Cranking Power or Amp Hour(capacity) is required. Keep in mind, the size of the battery cables used to connect the batteries should reflect the amount of current that will flow through them. Here at Bohannon Battery, we build custom cables that can be used for any application. Give us a call at 386-328-9024 and we will custom build cables that fit your needs. Batteries are placed in series when a higher voltage is required. In order to place two batteries in series, connect the Negative of the first battery to the Positive of the second battery. Two 6 Volt batteries that are connected together in series will produce 12 Volts. If the batteries are rated at 200 Amp Hour and 400 Cranking Amps, in series, the output will still be 200 Amp Hour and 400 Cranking Amps. Only the voltage is changed. 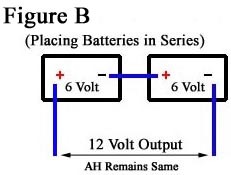 Figure B below shows two 6 Volt Batteries connected in Series. Most electric wheelchairs work on a 24V System. Batteries being used to power a 24 or 36 Volt Trolling Motor. Many Military Vehicles use 24V Systems. Most Golf Carts use six 6 Volts connected in Series to create a 36V System. More will be added to this shortly.